Terrorists are being given a “de facto amnesty” while the thousands of non-fatal terror attacks remain outside of the historic case review process, a victims’ campaigner has said. 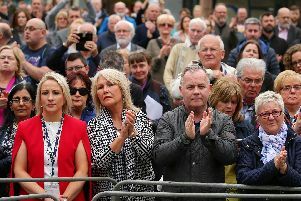 South Down UUP representative Alan Lewis said many victims are angry that while more than 3,200 deaths will be re-investigated, all those who were severely injured or traumatised – but survived – are unlikely to see justice done. Mr Lewis added: “I have recently been working a case which involves an IRA attempted murder, which occurred in the south Down area. “I wrote to a senior detective on the matter in September 2017 and received a reply twelve months later, and the contents astonished me. The process of investigating Troubles-era deaths has been dogged by resourcing and funding difficulties and, to date, there have been no signs that the government will make more money available to conduct an even greater number of investigations. In December 2016, ACC Mark Hamiliton, head of the PSNI’s legacy and justice department, issued a statement clarifying that the HET (Historical Enquiries Team) had a remit to “review all Troubles related deaths” but not non-fatal incidents. In July this year, Chris Flatt of the NIO told the NI Affairs Committee at Westminster that while those injured during fatal incidents would be entitled to copies of the investigation reports, if the workload was increased to include all of the other injury-only cases “we would be talking about tens of thousands of investigations”. Mr Lewis said: “We need to see the restoration of the policing board, thus ensuring proper governance and accountability of the PSNI. Assistant Chief Constable George Clarke said: “PSNI figures show that from 1969 to 1998 in excess of 35,000 shootings, 15,000 bombings and just over 3,200 deaths were reported to the Royal Ulster Constabulary. “We fully appreciate and acknowledge the suffering experienced by those seriously injured during the Troubles. However, the PSNI does not have the capacity to review or proactively re-examine non-fatal, Troubles-related crimes committed where there is no binding legal obligation to do so. “We will only review non-fatal incidents related to the Troubles where exceptional circumstances apply such as where credible evidence or new information comes to light. “I acknowledge that this will be disappointing for those affected by crimes over this period however, the reality is that if we were to review or re-investigate all non-fatal cases, it would require such a significant use of our resources, that our ability to protect the people of Northern Ireland today would be drastically undermined.